You can use the information from the press releases below and any of our copyright free images below. Aqua Furnishings specialises in marine soft furnishings, using fabric suitable for a marine environment. They offer curtains and blinds that stay flush to sloping walls; box seating cushions in fabrics that are soil and stain resistant, outdoor seating cushions in water resistant or water proof fabric; lastly made to measure mattresses using Freshtec toppings that allow air to circulate and keep you cool. 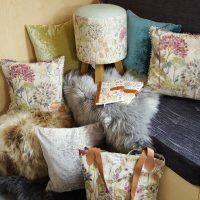 All these products will be demonstrated at the Crick Boat Show, including their own brand of ‘Aqua by Design’ fabrics. 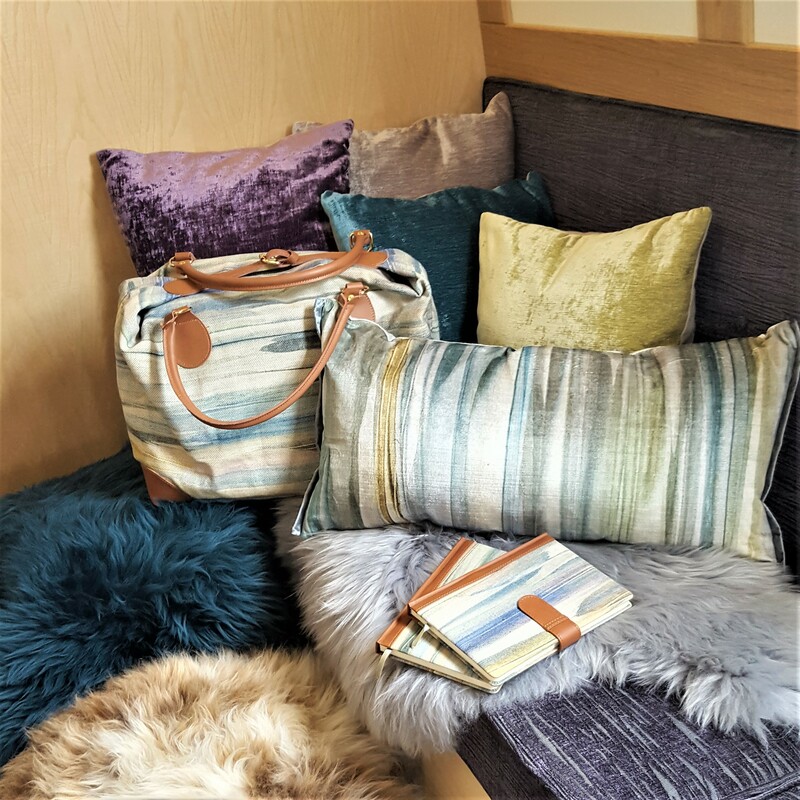 Curtains and roman blinds will be on show in the canal collection, a design inspired by the inland waterways, featuring narrowboats, locks, bridges and wildlife in different seasons. 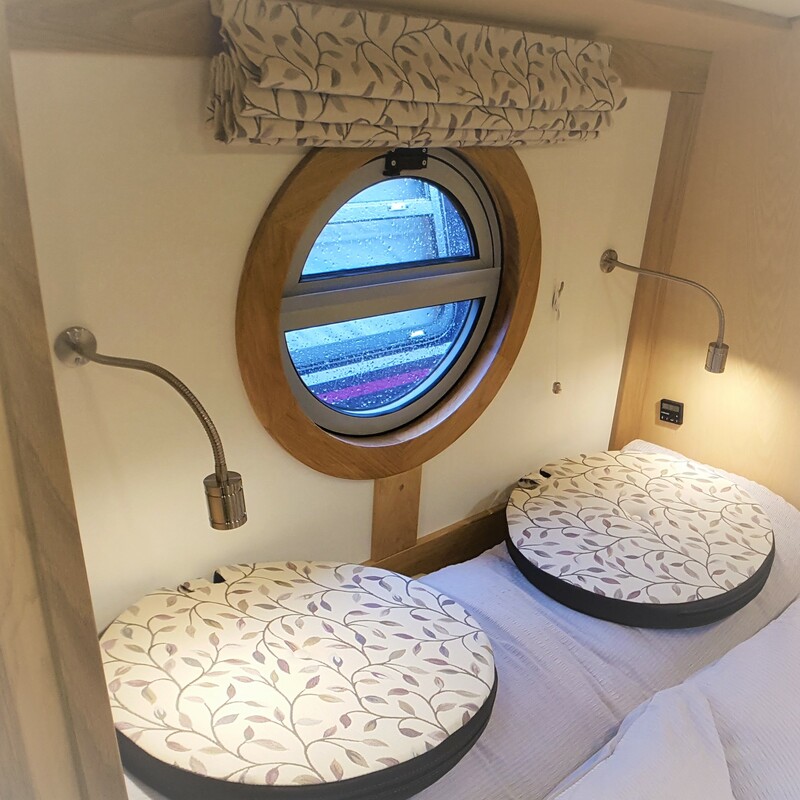 In this design, you can choose suitable fabrics for windows, seating and have bespoke items made to order such as bedspreads, armchairs and porthole bungs. NEW this year is the nautical fabric collection, featuring yachts, lighthouses and boating wheels. In addition, Aqua by Design has developed a range of 100% organic cotton homeware accessories and ‘zero waste’ gifts– using fabric that would otherwise have gone to waste. All homeware and gifts will be available to purchase at the show. 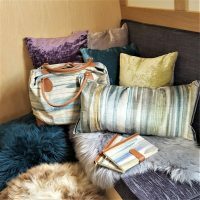 Bespoke box cushions for dinette & saloon seating areas will be at the show, you can sit on example box seating in the consultation corner and see a range of other cushions, fabric choices, and finishes available. This year you can pre-book an appointment with Aqua Furnishing at Crick Boat Show. Bring with you the measurements of the seating or windows, you look at fabric choices and we’ll do an estimate. Tel 01283 585718 or email helllo@aquafurnishings.co.uk to pre-book an appointment or request a quote online www.aquafurnishings.co.uk. Exciting times are ahead for Derbyshire based boat builder Aqua Narrowboats who have gained planning permission to build a 7500sqft purpose built factory in Foston, Derbyshire. The facility, which will include a 40 tonne crane and boat testing tank, will enable the business to increase production to allow them to build two new boats at a time, which will include both narrowboats and widebeam boats. The company, who have been based at Mercia Marina for 9 years, have seen steady growth since establishing in 2004. As part of the development a dedicated reception and showroom will be built. This will provide much needed space for their boat build customers as well as customers of their newly launched Aqua Furnishings business. This side of the business supplies and retails seating, blinds and soft furnishings for new and existing boat owners, and has also seen steady growth since launching in early 2017. The increase in production and growth means that Aqua Narrowboats will be recruiting additional skilled craft people to keep up with demand. They will also be taking on new Apprentices to increase young talent and skills that the boat building industry is currently lacking. As part of the expansion the company will also be relocating their luxury hire boats to Barton Turns Marina, on the Trent & Mersey Canal in Staffordshire. This move will allow hirers quicker access onto the main canal network at Fradley Junction, gaining them an additional days cruising on a holiday. “This is a fantastic opportunity for us, and the whole team are keen to move in so that we can continue to be progressive and innovate the inland boating building industry. We have enjoyed our time at Mercia Marina but we out grew the premises a number of years ago and have been unable to expand at the site. Our new development which we move into in September 2018, will provide us with much needed space allowing us to increase production and productivity. The factory will also provide a showroom and reception allowing us to create a better experience for both our Boat Build and Aqua Furnishings customers, something that we have aspired to for a number of years. Aqua Narrowboats was established in 2004 with one hire boat fitted out by Justin and Jane Hudson-Oldroyd. The boat operated from Kings Bromley Marina and proved very popular. Another self-built boat was added in 2006 and the business continued to expand. In 2008 a 10 year lease was obtained for the workshop at the newly built Mercia Marina and the hire boats were moved down from Kings Bromley. A Carpenter and Marine Engineer were taken on to expand the business into bespoke boat building and marine repairs. Throughout the recession the business has seen steady growth and now employs a total of 13 staff. There are currently no plans to start building steel boat shells – these will continue to be outsourced from reputable shell builders. Marine Engineering Work will cease at the end of 2017, other than work already booked in. The Factory will be occupied from late September 2018 and the premises at Mercia Marina vacated in October 2018. The hire boats will be moved across to Barton Turns in January 2018 ready for the start of the season in March. The new development will be freehold and owned entirely by Aqua Narrowboats. Aqua Furnishings was successfully launched at Crick Boat Show 2017 and proved very popular with the canal boat community. 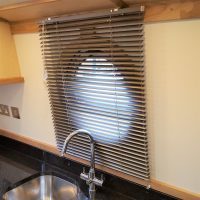 The company has been established by boat builder Aqua Narrowboats who have developed years of narrowboat interior experience and supply contacts. They have developed a range of smart solutions for small spaces such as roman and venetian blinds that are flush to the walls, all in a range of over 120 fabrics. 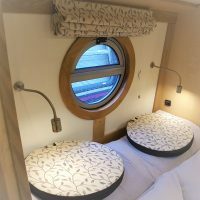 Customers can then match stunning porthole cushion liners and scatter cushions with the same fabrics. Furthermore galley inventory can also be matched to create a truly stunning interior style and design. Narrowboat furniture is always difficult to find due to the limited space in a canal boat. However, Aqua Furnishings have found 3 luxury reclining chairs, petite enough to fit in your canal boat whilst still offering reclining and swivel features. These items of furniture proved most popular at the show, many customers trying out the new chairs and feedback was very positive. The furniture store aims to be a one stop shop for people buying a new or used boat. It aims to help boaters turn their dream boat into a stylish and beautiful interior space. We have established links with boat builders, marinas and brokerages, so Aqua furnishings can deliver to marinas across the midlands or to your boat builder. You can even book a visit with a sales consultant who will visit you at your boat and show you the range of fabrics and products we have to offer and help you measure.